Rachel St. Louis’s first flight in a small aircraft was in her father’s Cessna 172 at 9 years old. Upon taking the controls, she knew she belonged in the air. Last year she received a seaplane lesson and as the floats of the Piper Cub touched the glassy waters on 8 different lakes, her love for aviation was sealed. Rachel took this passion a step further and became determined to build her own aircraft. At EAA AirVenture 2016, Rachel will take delivery of a BushCat aircraft kit. She is only 14 years old and paid for it with the earnings from her jewelry business, Rachel’s Jewelry. Rachel has always demonstrated creativity and determination through designing jewelry. Starting with plastic bead and cords, she soon upgraded her earrings and necklaces to metal and found herself managing a small table at a local Christmas fair. Six years later, Rachel now attends 21 craft fairs annually with her mobile showroom. Rachel’s business success helped pave the way for diving head first into the aviation industry. 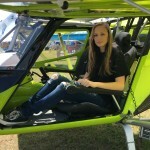 She plans to learn to fly in the BushCat she builds and hopes to attend college at Embry Riddle Aeronautical University. When asked what her dream aviation job would be, her answer was to fly the F22. With the help of her family, Rachel did extensive research on which kit aircraft to purchase. Much to her dismay, not many people took her goal of building her own aircraft seriously. That was until she met the people at AeroSport, a Wisconsin based dealer of BushCat and Sling aircraft. The SkyReach BushCat comes in several options: experimental amateur built (EAB), and experimental light sport (ELSA), and a certified light sport (SLSA). All three models are available in conventional gear or tri-gear configuration. The Sling 2 claims to be the “highest quality, high performance LSA on the market”. Its big brother, the Sling 4, is the 4-seat experimental version of the aircraft featuring a 115hp turbocharged Rotax engine. Aviation Insurance Resources (AIR) is the official insurer of AeroSport and BushCat and Sling Aircraft. At Sun ‘n Fun 2016 AIR agents met Rachel at the AeroSport booth and were delighted to learn her story. All of the agents at AIR are pilots and have an immense passion for the industry they serve. So much so that they are offering a scholarship to further the aviation goals of future pilots like Rachel. The ‘Get into the Air‘ scholarship will be awarded at EAA AirVenture to the pilot or student pilot who best describes their motivation to be involved in the aviation industry. Applications are available online here. No matter their background, each pilot (and future pilot) has a story to share just like Rachel. With persistence and determination there are no limits to what she may achieve. Whether you are a BushCat or Sling aircraft owner or builder, AIR looks forward to hearing your own story and assisting you with your aircraft insurance needs!